To honor World Wide Metric’s 45th anniversary Dark Horse Design developed a special, commemorative logo for the company to use in marketing throughout their milestone year. The anniversary logo was extremely effective in communicating a fresh, yet recognizable look to consumers. When the commemorative logo was unveiled it was so well received that a second project to honor the anniversary year was commissioned. World Wide Metric challenged Dark Horse Design to create a marketing piece, which would showcase the company’s rich history of experience, customer service, and unparalleled industry knowledge. Our innovative design team was up for the task and responded with a brilliant and comprehensive timeline. With experience and longevity serving as the backbone of World Wide Metric, Dark Horse was confident a timeline would be the best way to highlight the company’s events, milestones, and years of service. Instead of asking customers to read pages of information, a timeline provides comprehensive company history at a glance. Wall Graphic - Direct print to 3mm Sintra. The team at Dark Horse Design was able to efficiently organize and display an enormous amount of information into a compact, easy to read, conversation piece. Major world events were incorporated with milestones in the company history. World Wide Metric moments are blocked in their signature blue color and highlighted with their logo. Dark Horse Design transformed the World Wide Metric 45th Anniversary Timeline into an easy to assemble pop up banner for tradeshows. A larger wall graphic consistent with the revamped logo as well as the pop up banner was crafted for display at the office. 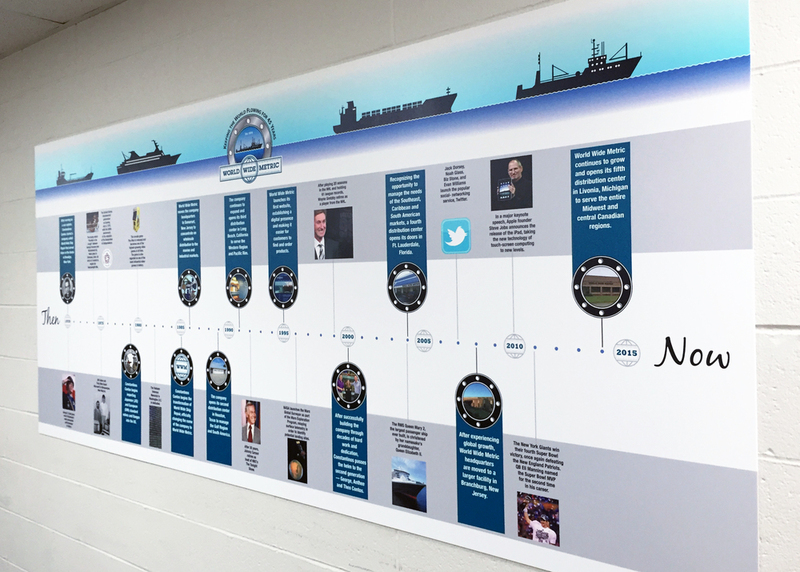 The timeline and coordinating wall graphic were used by World Wide Metric throughout all their exciting 45th anniversary festivities and can now serve as unique marketing materials at tradeshows and events for years to come. Step up your trade show material swag! Contact Dark Horse Design to start a commemorative logo and promotional items for your special occasion or celebration!